Key to encircling and containing China, US sets proxies in motion for color revolution in Malaysian streets. 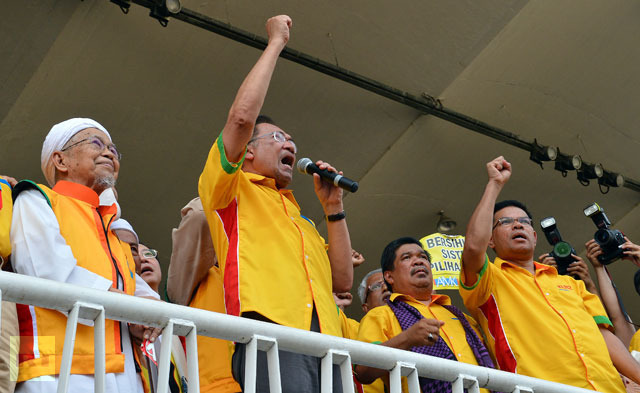 Image: US-proxy Anwar Ibrahim leads a Bersih rally in Malaysia. While Bersih has attempted to claim it is "independent" and simply pursusing "fair and clean elections," it is clearly a vehicle for returning Anwar Ibrahim back into power. Additionally, Bersih shares the same ties to the US State Department's National Endowment for Democracy (NED) as its crypto-leader Anwar Ibrahim - representing a dangerous and seditious conflict of interest. Pro-Pakatan Rakyat groups have vowed to overthrow the Barisan Nasional government this year through a massive street rally. general election was too long, and vowed to overthrow BN this year through “force”. Electoral watchdog group Bersih 2.0 steering committee member Hishamuddin Rais pointed out that it was useless to take their unhappiness to the courts as he claimed the justice system was being controlled by the government. “That is why we must take to the streets. We have to come out. What Najib likes is wrong, and what he doesn’t like is what we have to do,” he said. “We will mobilise a big group and rally on the streets. This is not a threat, this is a promise,” he stressed. 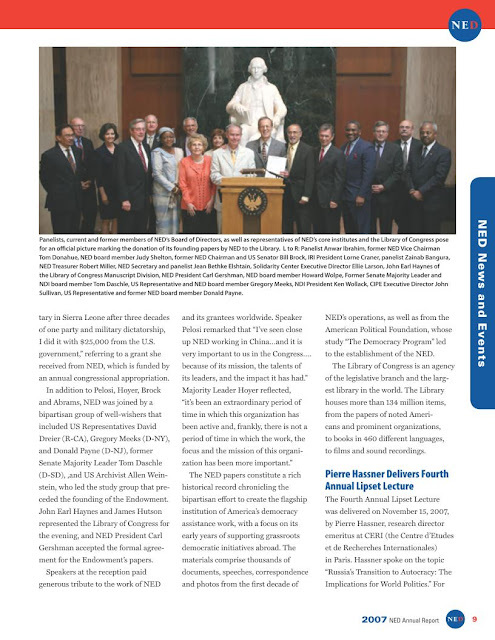 Bersih, of course, is a US State Department-funded opposition front aimed to bolster US-proxy candidate Anwar Ibrahim, formerly of the IMF and World Bank, and a frequent visitor to the insidious National Endowment for Democracy (NED) in Washington D.C. It is in fact, NED that funds Bersih through its subsidiary, the National Democratic Institute (NDI). In addition to Bersih, other faux-electoral monitors are also directly funded by the US government. While the Western media attempts to portray such organizations as "independent," the Merdeka Center for Opinion Research, for example, is likewise funded directly by the US through NED. 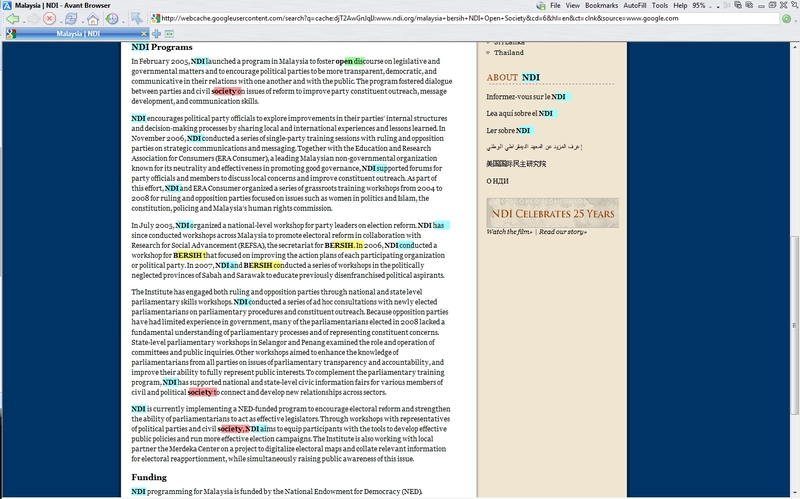 Anwar Ibrahim himself was Chairman of the Development Committee of the World Bank and International Monetary Fund (IMF) in 1998, held lecturing positions at the School of Advanced International Studies at Johns Hopkins University, was a consultant to the World Bank, and a panelist at the Neo-Con lined National Endowment for Democracy's "Democracy Award" and a panelist at a NED donation ceremony - the very same US organization funding and supporting Bersih and so-called "independent" election monitor Merdeka - paints a picture of an opposition running for office in Malaysia, not for the Malaysian people, but clearly for the corporate financier interests of Wall Street and London. Without a doubt, this premeditated sedition aimed at Malaysia's ruling government has been designed, funded, and directed from Washington on behalf of Wall Street and London, not by the Malaysian people on behalf of Malaysia's best interests. The street protests conducted by Bersih have all the hallmarks of US-backed "color revolutions," and this recent attempt to overturn election results that do not favor an overt US-proxy, foreshadows the same destructive, divisive, violent, and regressive unrest that has plagued Tunisia, Libya, Egypt, and Syria after US-engineered uprisings have left each in turn destabilized, failed states overrun by extremists, dictators, and traitors many times worse than the governments activists sought to overthrow. And with Tunisia, Libya, Egypt, and Syria in hindsight, will Malaysians fall into this same familiar trap? Whatever discontent Malaysians may have with the current government, it is all but assured Bersih and US-proxy candidate Anwar Ibrahim will compound perceived injustices while compromising Malaysia's political, social, and economic stability, and begin channeling Malaysia's resources and energy toward foreign interests and designs, particularly those involving the encirclement and containment of China. An Alternative to the Tired Ploy of "Street Protests"
For the average Malaysian seeking progress, a better bet than joining US-funded sedition would be to turn their attention toward organizing locally and focusing on pragmatic, rather than political, goals. Education, local economic development, health, and local infrastructure are all areas Malaysians, regardless of political affiliations, can work together on and improve regardless of who holds public office. And while special interests, both foreign and domestic, can indeed hinder such progress, they do not make such progress impossible. What is certain, is that corruption amongst Malaysia's ruling party pales in comparison to that of Wall Street and London - and Malaysians will place themselves in the path of guaranteed destruction by inviting in the very people who dominated them before achieving a hard-won independence. Democracy, in reality, is supposed to be a bottom-up exercise drawn from the grassroots. Bersih is clearly a vehicle for Anwar Ibrahim and his political machine - one whose message is funded, crafted, and declared from Anwar's political advisers and foreign backers, and disseminated across the movement - however cleverly "democratized" Bersih may attempt to appear. Malaysians do not need a political party to improve education, to grow their own food, to develop business locally by leveraging technology, or to improve local infrastructure and strengthen local communities. The time being wasted to assist Anwar Ibrahim's worming back into political power at the cost of peace, stability, and prosperity could be better spent developing truly grassroots pragmatic power. Real revolutions do not happen out on the streets - they are manifested in our schools, across industry, and within our communities. They are marked by pragmatism and true, enduring technological and socioeconomic progress - none of which are even promised by Bersih and Anwar Ibrahim's "People's Alliance." If the people of Malaysia truly want "change," they are going to have to do it themselves by building local institutions that technologically and pragmatically solve real problems rather than simply craft slogans and campaign promises that merely pander to the concerns of the people. Following the flags of Bersih into the streets will undoubtedly begin instability and division across Malaysian society that will jeopardize, not spur, real and very necessary pragmatic progress.